GBPUSD is under the influence of some economic news reports such as PMI Construction in the UK and Britain’s Markit services PMI data for April for GBP and the US reports concerning ADP Employment Change and Markit Services PMI. Yesterday the pair tried to increase but it fell again today morning. 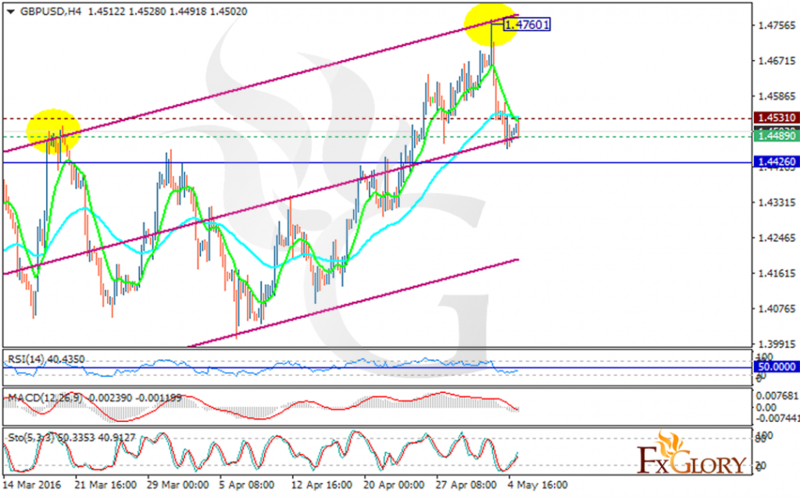 The support lies at 1.44890 with resistance at 1.45310 which both lines are above the monthly pivot point at 1.44260. The EMA of 10 is meeting the EMA of 50 right on the resistance line. The MACD indicator is in negative territory and the RSI is below the 50 level but the stochastic is showing a price growth. Traders can wait for a better chart setup to decide however price decline is expected targeting 1.4400.